Under the BAPCPA law changes of 2005, one must now "qualify" to file a Chapter 7 bankruptcy case. This qualification is based upon how their annual gross income compares to the median annual gross income of a similar sized family in Florida. However, even if your income exceeds the state median income, many clients still qualify because they still can pass the "means test." The means test is a key feature of the 2005 BAPCPA bankruptcy amendments. It incorporates state median income figures to determine who should pay back some of their debts in a Chapter 13 plan. Prior to BAPCPA, almost any resident of the United States could file a Chapter 7 bankruptcy. Because of "perceived" abuse of the Chapter 7 Bankruptcy protection, the new bankruptcy law includes a test, called the means test, to determine whether an "assumption of abuse" exists. Whether an assumption of abuse exists will determine whether you may, or may not, be eligible to file Chapter 7 bankruptcy. The Chapter 7 means test applies to individuals whose debts are primarily consumer debts such as credit cards, car debt, or mortgages. Debtors whose debts are primarily business debts do not have to take the means test and may file Chapter 7 bankruptcy regardless of their income and expenses. 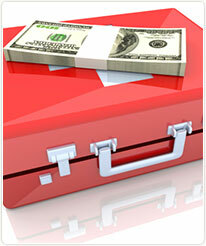 Most filers can keep all of their assets because they are protected by exemptions. If there are non-protected assets, they can be turned over to the court for liquidation, or they can be settled in a manner that allows the client to keep the property. The Chapter 7 debtors typically receive a discharge of their debts within three to four months from the date the case is filed with the court. The filer does not pay anything to the creditors. There is no payment plan - only the turning over of non-exempt property, if any. This plan will designate a monthly payment to the bankruptcy trustee for a 3 - 5 year period. The payment amount is based upon a formula and it is not necessarily payment in full of the entire debt. The payment amount will be arrived at by applying a formula that takes your expenses into consideration and determines what your disposable income is. From that disposable income is where the amount of repayment is calculated. sometimes the payment is as low as $50.00 a month. At the end of the plan, the balance of the debt is discharged, or "wiped out" after all plan payments have been made. The filer can keep all property in a Chapter 13 bankruptcy that they do not want to lose, even if that property doesn't qualify as exempt. But the value of that property must be paid to the trustee over the payment plan. If the filer has fallen behind on mortgage or car payments (or other secured debts), the payment plan allows the client to catch up on these payments, and retain the secured property. Call today to schedule a free consultation with one of our Fort Lauderdale bankruptcy attorneys.